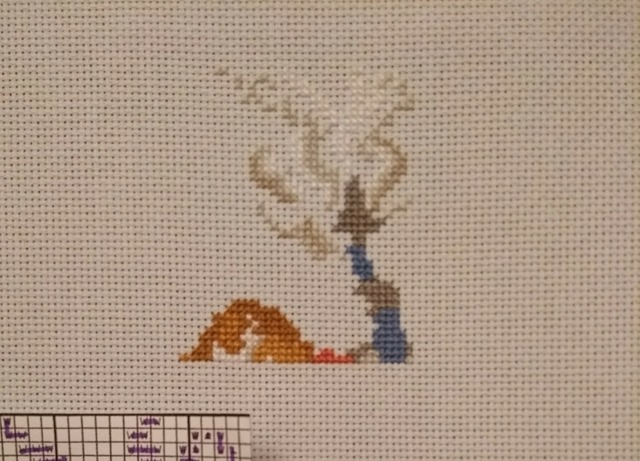 This is my first progress update on the Cut Thru Garden Shed cross stitch. Designer credits are here. 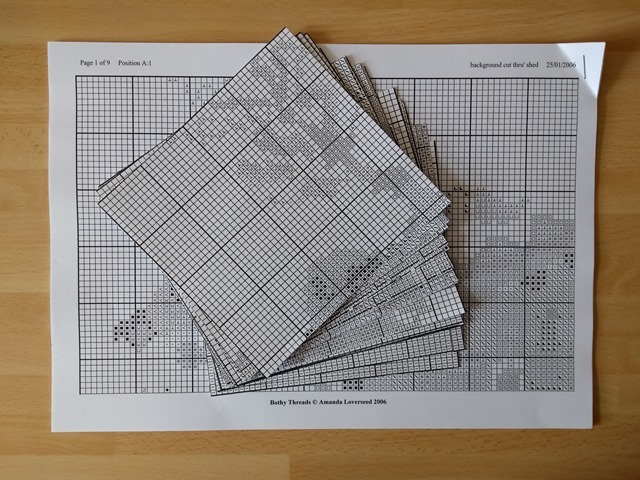 For the last couple of kits I’ve stitched, I made a working copy of the chart and then chopped it up into equal sized squares so I can work on one section at a time. 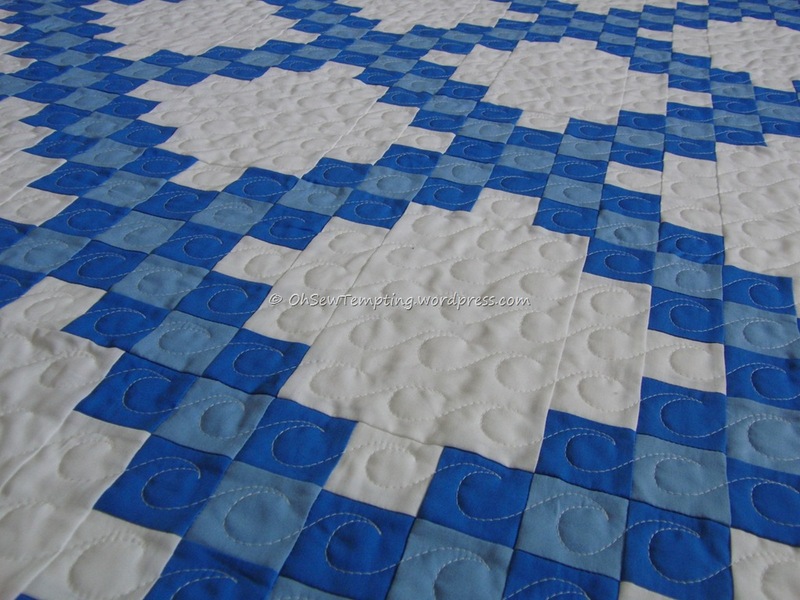 I then pin one square of the chart to the fabric and stitch until it’s completed. It’s like having a mini finish when I complete a square and I find it usually motivates me to get more done. When I divided this design up I completely ignored the fact that some squares are fully stitched and others have hardly anything to do. I just took the widest width and height and divided the entire area. I’ve started at the top left so the first section has lots of sky which is unstitched so it doesn’t look like I’ve done very much this time. I’ve decided to do the back stitch after each section is completed as it worked well last time and it saves waiting until the end for some of the design details to appear. What a difference it makes! If you need a reminder of how it’ll all turn out in the end, you’ll find a photo in this post. I’m really enjoying working with 16 count fabric again. 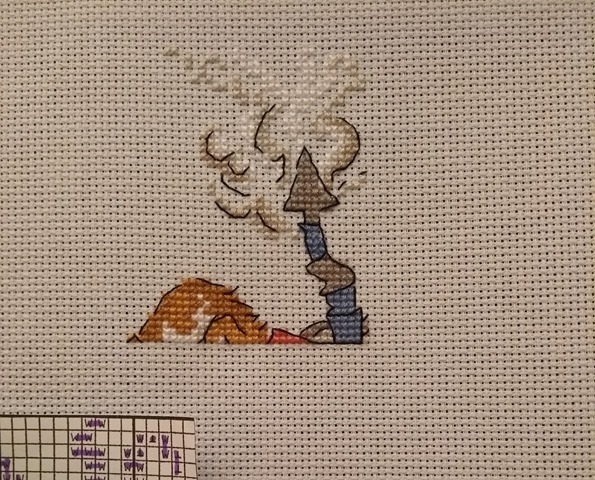 I think it’s probably my favourite size for cross stitching. I’ll be stitching to the right of this part for the next update. We’ve got a new member to introduce to the SAL from today. Her name is Clare. Welcome aboard Clare! As usual, it’s worth hopping around the rest of the lovely SAL blogs by clicking the names below. You never know, you might be inspired to make something too. We live all over the world so you may need to allow for time differences. Posting takes place every third Sunday, local time. Our next updates will be posted on the 11th November 2018. You’re dead right about the back stitching. It’s gone from “er, what?” to “oh, I see!”. Your way of breaking the chart down is very clever too. I know it would drive some people round the bend but it works for me. Breaking down a larger piece into individual sections is a great idea. Looking forward to seeing how this progresses. This one is a lot easier on colour changes than the last project so it should be fine. It’s also good to have just a small chart to work from. I think 16 count is my favourite too, doing back-stitch as you go a long is definitely a good idea. I like the idea of working in blocks, but my brain tends to like seeing a feature finished, rather than a square! It makes no difference to me whether I finish a feature or not because I tend to work upside down for the first half anyway LOL. What a clever idea with the pattern, and mini finishes to keep you motivated. I agree with you about 16 count, but I am finding it harder to see it these days. Thank you for welcoming me to this SAL.Nice to see I`m not the only one to backstitch as I go when patch says needed. Happy Stitching. Hi Clare! It certainly works best for me but I haven’t always worked this way. Glad to see I’m not the only one altering my charts to make them easier to work with. I’m terrible at stitching one multiple pages, so I always scan my chart and turn it into a single seamless chart PDF I then use on my tablet. This allows me to not make any mistakes counting, and also I can highlight what I’ve done, erase, redo, no limitations 😀 – It’s a very nice start, doesn’t matter if some squares are more or less labour intensive, in a way it gives you a sense of achievement and more time between some updates more than others. That’s a great idea! I do mark my chart copy with a felt tipped pen as I go but highlighting electronically sounds safer. One of these days I’ll draw on the project by mistake! I really like your method and will try it on my next project. As of right now, I’m going to finish the section I’m in and then do the backstitching – I think this will make it that much easier to keep my mojo going. Thanks so much for the tips! I love this piece, and think your method of self motivation is excellent. I may give that a try. Anything that means I get projects finished is worth it for me. Your latest SAL has me intrigued I’m sure it will be very interesting. Your previous cut throughs are brilliant. I could look at them for ages and find new things in them. This one is the Garden Shed and so far it’s as much fun to stitch as the others. Sounds like a great plan for a cute project. Hope you don’t get thrown off by those blank spaces (I would!). I mark the chart as I go so I rarely miscount. Once I’ve got the correct starting point it seems to work fine. If you can resist looking at the other bits of chart it’ll work fine. I was warned that I might get lines due to different tensions between squares but so far that hasn’t happened. That’s what I was wondering. I was working by page on Winnie the Pooh and have lines where I continued color from a different page on a separate occasion. The process is still a great take away! I work on a rectangular frame that I loosen off each time I put it down. Maybe that makes it work better but I don;t know for sure. A great start and what a difference the bs makes to this one. Thank you. So far, so good! I had to look it up and yes, I remember this beautiful and funny embroidery. You are so smart, dividing your work into pieces and also doing the back stitches at the same time! I too have always left the back stitching till the end, so doing it as you go would be good to try. I haven’t tried 16 count, my favourite is 14. As for breaking up the design into manageable chunks, what a great idea. I want to try that! Go for it! The chart is more manageable on a small piece of paper for me as well. I had been wondering how you had the discipline not to finish up a bit of thread in the next section — but physically cutting up the chart is such a great idea! I always make a photocopy so I can highlight where I have stitched, but I end up folding it and it gets raggedy on the folds. Next time I do a charted design (a.k.a., when I finish the swans!) I’ll try your technique. Thanks for sharing! I highlight the copy too 🙂 The other chart squares are put away so I’m not tempted to stray onto them at all. Wow the backstitch really does make all the difference! And I love your way of handling cross stitch projects. Not only are they mini finishes for you but they’re great to see for us too! Thank you 🙂 I’m busy with the next bit now and there’s so much back stitch to do! I’ll keep telling myself it’s worth it.